There has been increased awareness of pain recognition and management in small animals and this science is also gaining more acknowledgement in the world of horses as well. The Facial Grimaces Score used originally to identify pain in rodents and rabbits has been incorporated into a &apos;grimace scale&apos; for equines as well. It uses ear position and tightening of the muscles around the eyes and mouth to come up with a score (0 – no pain, 1 – moderate, 2 – obvious). Everyone wants to be greeted by a bright-eyed, soft and relaxed face. The horse is telling you something hurts when they avoid looking at you, appear despondent, clench their jaw, flatten ears back and/or squint their eyes. The choir was obviously present and little preaching was required as Henderson rolled through a barrage of images asking the audience to denote which ones depicted animals in pain. By stance, facial cues and action the savvy auditors were hitting the mark and also picked up on the fact that circumstance plays a role. How many people have had the phone call of alarm when a passerby sees a horse flat out in the field when it was actually just napping in the sun? Flehmen is another response that can be circumstantial. It can occur due to an interesting smell or taste sensation but it can also be a moderate pain response displaying nostril and mouth tension. The stallion curling his upper lip testing for pheromones when a mare passes by is a different context than the horse who didn&apos;t finish his feed, is stretched out with his poll low and is showing the flehmen response. Grooming is the next interaction where paying close attention will tell you much about your horse&apos;s health. Rather than quickly dusting off the saddle area and jumping on to ride, take the time to run your hands over their whole body, especially the back and legs, before and after work, checking for any heat, swelling or reactions that can be early indicators something is not quite right. Obvious pain requires a veterinary examination. When a horse comes in from the paddock hopping lame, it can often be hard to tell if it is an abscess requiring a simple poultice or a fracture requiring much more intensive treatment and stabilization. When acute pain is obvious; don&apos;t guess or delay – call the veterinarian. For less obvious lameness, your veterinarian has been trained to assess the severity on a scale from one to five. Early intervention increases the chances of a good outcome and can prevent matters from escalating into a much worse injury. 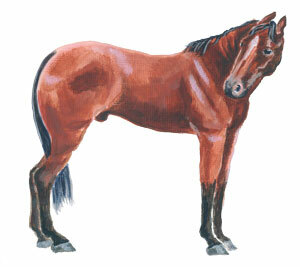 The veterinarian will check the horse in both walk and trot, on straight lines and turns. “A lameness that is visible at the walk is automatically going to be at least a three if not higher,“ comments Henderson. After a thorough exam, a rehabilitation plan can be made. Chronic pain will impact the horse&apos;s ability to heal and their quality of life. “It is an old way of thinking to want a horse to be a bit sore in the healing process to prevent it from box-walking,“ explains Henderson. “Our ability to control pain both every day and certainly in the medical environment is becoming more and more recognized as mandatory.“ Once the horse is controlled in its pain, they can move better and heal faster and therefore do not lose as much muscle quality during the healing period. Modern treatment methods can also help avoid the knock on effects of stomach ulcers and sourness that often accompany chronic pain. Choosing the right pain control method or treatment is another conversation to have with your veterinarian as there are many option available and extended use of Phenylbutazone can have negative effects on a horse&apos;s stomach. In addition to being on the look-out for signs of pain, a dutiful horse owner is always employing prevention practices. They apply poultice and wrap horse&apos;s legs to stem swelling after a hard work out and give them time to recover. Similarly, we take care of ourselves with rest after a work-out, a hearty meal to replace nutrients and perhaps a hot bath. Our horses count on us, their primary care-takers to be diligent and attentive in both prevention and early detection of pain. For further information visit: EquineGuelph.ca.